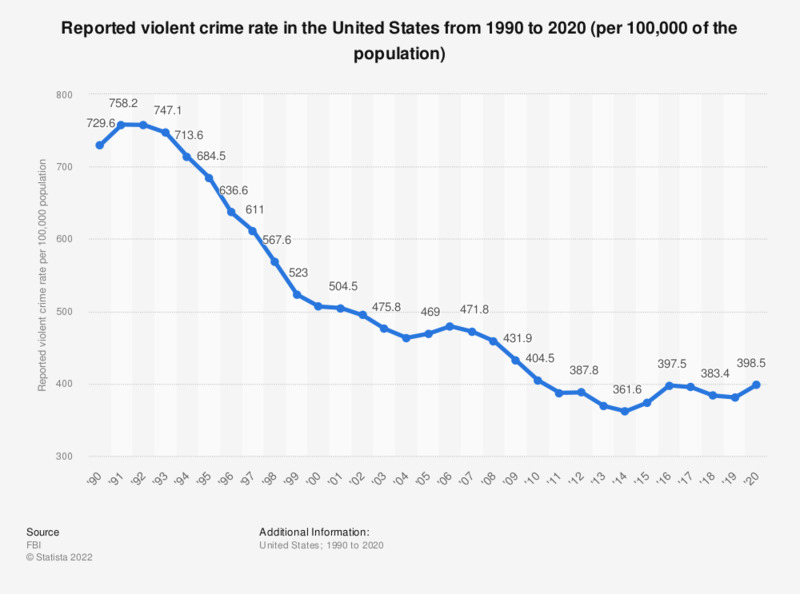 This graph shows the reported violent crime rate in the U.S. since 1990. In 2017, the nationwide rate was 382.9 cases per 100,000 of the population. Even though the violent crime rate has been decreasing since 1990, the United States top the ranking of countries with the most prisoners. The United States Federal Bureau of Investigation tracks the rate of reported violent crimes per 100,000 U.S. inhabitants. In the timeline above, rates are shown starting in 1990. The rate of reported violent crime has fallen since a high of 758.20 reported crimes in 1991 to a low of 361.6 reported violent crimes in 2014. In 2017, there were roughly 1.25 million violent crimes committed in the United States. This number can be compared to the total number of property crimes, roughly 7.69 million that year. Of violent crimes in 2017, there were roughly 810 thousand aggravated assaults, making this offense the most common of violent crime offenses. Though the violent crime rate was down in 2012, the number of law enforcement officers also fell. Between 2004 and 2009, the number of law enforcement officers in the United States rose from around 430,000 to 450,000. However, since 2010, the number of officers fell to 429,925 officers in 2012. That year, the crime clearance rate was highest for murders and non-negligent manslaughters, with around 62.5 percent of murders being solved by investigators and a suspect being charged with the crime. Roughly 55.8 percent of aggravated assaults were cleared in 2012. A dossier of statistics on violent crime in the U.S. can be found here. Everything On "Crime and Penitentiary System In China" in One Document: Edited and Divided into Handy Chapters. Including Detailed References.